I’d like to take a moment to thank Jennifer Pitt for inviting me to share her space in the virtual world. Having the opportunity to reach out to new readers is a privilege I don’t take lightly. I am a creature of habit – not because I’m lazy, but because change is uncomfortable. Newvember is about embracing change and recognizing that even little things can make a big difference. When I started writing the book, I had no intention of creating something with depth and perception. I wrote from the heart with complete abandonment, but when readers started weighing in with their opinions, I knew I had created something entirely different. This book was supposed to encompass all things superficial. The plot is a snapshot of one month in Willow’s life. At the time of writing, to some extent, it was also a snapshot of my life. I wasn’t a risk-taker, and I kept to a pretty basic routine. So when Jo dared me to write a novel in 30 days, I was uncertain about where this challenge would lead me. The simple act of writing regularly had a tremendous impact on my day-to-day life. Before kids, I was a technical and copy writer. For as long as I can remember, writing was the only job I’d ever wanted, but focusing on nonfiction had taken its toll. I used to tell people it sucked the writer-soul out of me, but in truth, it prepared me for the path I was meant to take. It gave me the discipline and skill necessary to reach a daily deadline, edit on the fly, and eventually release the completed novel as an eBook. The biggest risk I took was in starting the journey. I was terrified of putting my work on display, of disappointing readers, and receiving negative feedback. I hadn’t considered the possibility that readers would be inspired by my fictional character’s risk-taking deeds. They were… and five years after publication of the first edition, I decided Newvember needed a face-lift to remove the excess, smooth out the wrinkles, and fill in the gaps. My intention had been to gift the world with silly stuff and fluff – the complete opposite of the writing I’d been producing years before. Instead, I delivered a book that not only inspired readers, it inspired me as well. One small change in routine sent my life spiralling into a new direction. Since 2010, I’ve published four novels, two short stories, and started a serialized novel. My risk-taking extended past personal goals to help other Canadian authors realize their dreams when I started Morning Rain Publishing with my two partners. If I had never accepted Jo’s dare, I wouldn’t be here today. Please remember to stop by Chantel DaCosta’s blog on November 18th. 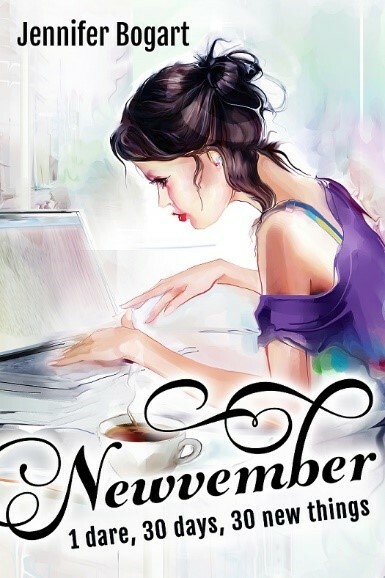 She’ll be posting a review and excerpt of Newvember! And don’t forget to enter the Rafflecopter giveaway at the end of this post. It’s free to enter and there are some really great prizes! 1 dare, 30 days, 30 new things… The dare was simple, but it turned into a life-altering journey. This is inspirational thinking in disguise. Willow’s life will never be the same after Newvember.